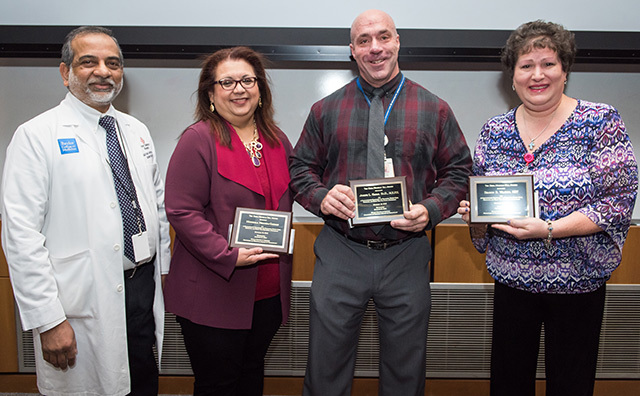 The 19th Annual Reba Michels Hill Memorial Grand Rounds were held recently. Awards were given to Neonatology non-physicians who have made a significant contribution to advancing the quality to which Dr. Hill was dedicated: compassionate commitment to education, patient care, research and family. Dr. Gautham Suresh, chief of service, Neonatology, presents Reba Michels Hill awards to Myrthala Miranda-Guzman, senior administrative assistant, Neonatology Department; Joseph Hagan, research statistician, Neonatology Department; and Sharon Wojtow, advanced respiratory care practitioner, Respiratory Care Department.